If you have installed the October 2018 Update for Windows 10 already on your own machine or PCs that you administrate, you may have encountered a number of bugs in that particular version. Microsoft had to pull the update shortly after release in early October 2018; it took the company six weeks to re-release the update. The new version fixed some of the issues but not all of them. Microsoft promised to do better in terms of update transparency and quality, but did release a statement that update quality was better than ever. Microsoft updated the known issues in the update recently again on the official support page. The new issue affects Seek Bar behavior in Windows Media Player. After installing this update, users may not be able to use the Seek Bar in Windows Media Player when playing specific files. The company is working on a resolution according to the support page. The description of the symptom is rather vague; while it highlights the program -- Windows Media Player -- and the issue itself -- Seek Bar may not work -- it fails to define "specific files". Which files or file types are affected by the issue? Microsoft does not reveal the information; the omission of vital information, in this case details on the affected files, means that it is impossible to assess the seriousness of the issue. Is it a critical issue or not? If popular file types are affected it is more likely critical but if an obscure file type or even only some specifically encoded files are affected, it is not. The lack of information falls in line with something else that I have been criticizing for years: the order in which updates and linked resource pages are published. Microsoft -- sometimes -- releases updates through Windows Update and other official distribution channels before support pages are published. While it is possible to install these updates, it is impossible to know what they fix or do until the support page gets published. Support pages may not reveal much about updates either which brings us back full circle to the issue described in this article. I'd like to see an effort to improve transparency when it comes to updates and issues. Administrators need detailed information on updates and issues, and Microsoft should make an effort to provide additional details where applicable. Microsoft should provide better (detailed) information on updates that it releases and issues that may be experienced when these updates get installed. Also, please give us the ability to completely disable all telemetry gathering and data sending. Microsoft didn’t convert Windows User to Windows Consumer through Win10 for nothing. Your data is not just valuable to MS, but also many third parties(including the gvt). IMO Something as a Service means *User as a Product* in current industry. @Coulson, it is possible that you and others and myself are slowly but surely abandoning the struggle for privacy. Is it a matter of time or will there always be some of us to keep on the fight for human dignity? There are plenty of us who will never give up that fight. They’ve declared war on us all, and surrender is not an option. Go to at least an annual update and stop using consumers as unwilling beta testers. The situation is beyond begging M$ to be more transparent. M$ is not interested in consumer biz anymore; it is more interested in enterprise biz. Nevertheless, the long-term goal is to wean both groups off machine-installed Windows and move to WaaS, Windows-as-a-Service, i.e. Windows via the cloud. It is high time to vote with one’s feet and turn your back to M$, that’s what I am working on anyway. I was thinking how could possibly one break such a basic feature, but I guess they have sent an update to a codec which is broken. What annoys me is this strict one update pack per month policy. If something is broken, well, you’re out of luck and will have to deal with this problem for the upcoming month. At best you could downgrade. Why not just send a small update and revert that particular change? This is something which happens frequently with phones too, even Google and Apple do this. Google broke things like flashlight functionality and notification LEDs, and they were only fixed after 30 days, and Apple with their complete incompetence broke the alarm feature on my iPhone so many times in so many different ways to the point where I had to rely on other devices for this feature rather than my iPhone – you never new if you were able to cancel an alarm, to snooz it, and for how many times, or if it would go off at all/, and it made me be late on a few different occasions. But as long as there are fanboys to shout and scream at you THIS IS SOFTWARE AND IT’S NORMAL TO HAVE BUGS BLAH BLAH BLAH we’ll never see a shift in this behavious – see moz://a. I find it funny how users want the latest OS version and then complain how broken it is. Who said users want it? Microsoft forces this stuff on us, whether we want it or not. Personally, I’d be much happier to go back to the old model, where the updates were just security fixes and every few years we got to decide whether or not we wanted to use a new version and when we were willing to take the time required to adapt to it. Am I correct in thinking that in their hurried attempts to fix the mess that is 1809, they are inevitably neglecting their previous versions (1803, 1709 etc.) which work much better? They are basically messing everything up, leaving everyone unsatisfied. I am sure someone at MS thinks it’s bad PR to admit their mistakes and switch to a yearly update cycle, but: it’s nothing compared to what they are doing now. 1507, 1607 and 1809 will always get prioritised over 1511, 1703, 1709, 1803 and whatever versions come up next year of Windows 10. They are LTS and Server releases, they are the ones making money, not the consumer versions. If you don’t like it change OS. Apple and Ubuntu provide good alternatives. Microsoft will never change. They were just as evil 20 years ago as they are now. They do not care about their users and never have (same can be said for Google and all the big IT corporates). You are absolutely right. Complaining does not help since M$ does not listen, will not listen and has its own agenda. Changing OS is the only way to free yourself from M$. It may not be an easy step but it’s worth it. I would imagine the explanations are for people who are more than “just” consumers. I know if Denise here read any of the known issues in this update stuff, she would say…wwwwhaaat? She is basically a newbie on a computer. I have been playing with computers for 34 years and I take the approach that if MS puts something out and one or several things are broke, I just don’t use them or probably never use them anyway. Transparency? Sounds like you have been watching the government spots about that. Now everyone wants to know everything about everything. lol I do NOT. MS will fix it eventually and why in the hell should I dwell on the small (broken) stuff I probably don’t use anyway? Let me guess, another paid Microsoft troll ? To put it politely: you don’t seem to realise that the world is slightly bigger than your own little bubble. The fact that YOU don’t use those broken things does NOT mean the rest of the world does not. So, to end your comment with a rhetorical question that belittles the rest of the world is slightly ignorant, don’t you think? Isn’t that the point though? 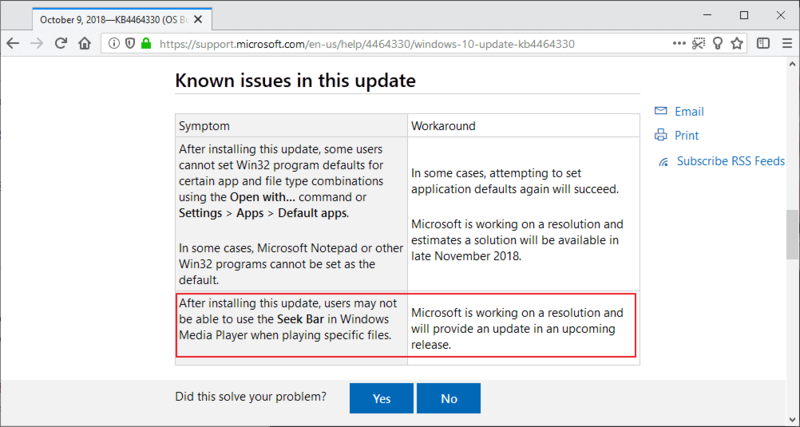 Microsoft doesn’t know the answer yet for which files are affected and which aren’t because they are still looking for the cause of the issue, which is why they state on the webpage that “Microsoft is working on a resolution” and “will provide an update”. MS doesn’t know how Windows works, so that’s why they are constantly screwing up. So far, I’ve converted 4 of 7 machines, most Intel i5 gen 3 or 4 based laptops with no issues. While it’s too bad there are any problems, I have encountered none in my simple life. Windows 10 is a nightmare and Microsoft knows it. They need to let Windows 7 users keep the only OS Microsoft got right. Stand behind their only good OS and keep updating it. Windows 10 is still a beta OS and until they get it stable for all users. Amit their mistake and move on, by letting Windows 7, users keep the stable OS that we paid for updated and running safely. Anthony Craig Hutzler. That’s not something they have to do anything about — they can’t stop you from using Windows 7 until the end of time, if you wish.